Drain the tomatoes reserving the oil, squeeze the tomatoes dry. In a food processor, process the tomatoes and garlic together until a smooth paste has been formed. Add drips of the reserved oil as needed to make a very thick paste. Mix all ingredients, except the olive oil, in a food processor and process until finely ground. Add 2 tablespoons of olive oil and continue to process. Add additional oil if needed to make a very thick paste. Mix all ingredients in a food processor and process until finely ground. Follow the process for any of the three fillings. 1. Using prepared frozen puff pastry, defrost in the refrigerator until pliable, yet still chilled. 2. On a lightly floured surface, unfold one sheet of puff pastry and roll out to a 9” x 14” rectangle. 3. Apply filling of your choice all over the rectangle in a thin, even layer. 4. Beginning long edge, roll the puff pastry in a tight roll to the rectangle’s midpoint. Repeat on the opposite long edge. 5. Repeat with the second sheet of puff pastry. 6. Place the rolls on a baking sheet and chill in the refrigerator until firm, about 1 hour. 7. Preheat the oven to 400°F. Slice the roll, crosswise, in 1/4-inch slices and place on a baking sheet lined with parchment paper or a baking mat. If necessary, chill slices on the baking sheet. 8. Bake in the preheated oven for 8-10 minutes, or just until the edge begin to turn a golden brown. 9. 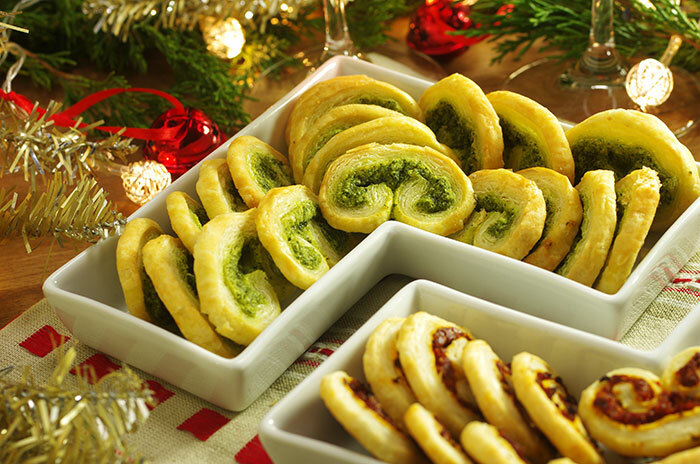 Cool the palmiers on the baking sheet for 1-2 minutes, then transfer to a cooling rack. Serve warm or at room temperature. DO-AHEAD: Make the fillings ahead of time, roll the puff pastry logs and freeze until ready to bake and serve.